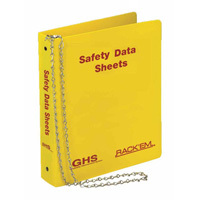 What are Safety Data Sheets and Material Safety Data Sheets (SDS and MSDS)? What does an SDS or MSDS look like? Are there any tutorials that explain how to read an SDS? Where can I get SDS's? Material Safety Data Sheets (MSDS) is what Safety Data Sheets (SDS) were called before the US Federal agency, OSHA, implemented its version of the Globally Harmonized System of Classification and Labeling of Chemicals (GHS) under the 2012 revision of the OSHA Hazard Communication Standard, 29 CFR 1910.1200 (commonly referred to as the HazCom Standard). In everyday terminology, the two terms are used interchangeably, however, strictly speaking, SDS's have a structured format and required information that MSDS's were not required to have. In the US and other countries that use the GHS system, SDS's use a standardized format as well as carefully defined risk phrases, safety phrases, and pictograms to convey their information. These are typically several printed pages longs. In contrast, MSDS's had no required format (they could have been freeform text or haiku as far as OSHA was concerned), no standardized wording, and varied in length, consistency and quality. We have seen them from 1 to 10 pages, with most being 2 to 4 pages. Employers who need to know the proper methods for storage, safe use etc. SDS's are not meant for consumers. An SDS reflects the hazards of working with the material in an occupational fashion. For example, an SDS for paint is not highly pertinent to someone who uses a can of paint once a year, but is extremely important to someone who uses that paint 40 hours a week. See the question "What are my rights to an SDS?" in the next section of this FAQ for more information. That said, the Household Products Database by the U.S. National Library of Medicine is a terrific resource for consumers to educate themselves on the hazards of consumer products. For example, use it to select an environmentally-friendly ant killer, to find out who manufacturers a particular product, determine what chemicals are in your shampoo, or figure out what products use xylene! See also: Manufacturer and employer responsibilities when providing MSDSs electronically for more about employer and manufacturer responsibilities. SDS Version in standard 16-part GHS format. An MSDS Version from the 1990's. See this OSHA Brief "Hazard Communication Standard: Safety Data Sheets" for more information about the currently required 16-part GHS format. Canadian Centre for Occupational Health and Safety's WHMIS 2015 - Safety Data Sheet (SDS) is a simple summary along with some common questions. How to Read A Safety Data Sheet (SDS) at Flinn Scientific. Reading Safety Data Sheets from MIT. SDS 101 - Reading and Using Safety Data Sheets from the American Veterinary Medical Association. Most universities and businesses have a collection somewhere on site. Check with your Environmental or Occupational Health Office or science librarian. Some organizations use commercial services to obtain printed, FAX or on-line copies of SDS's. The Internet has a wide range of FREE resources. A handy list of 100+ such sites is on our popular Where to Find SDS's on the Internet page. You can purchase software or internet subsciption services. Books such as the Merck Index and Prudent Practices in the Laboratory are not acceptable substitutes for SDS's, but these can give practical information on toxicity, physical properties and incompatibles. Notice: This page is copyright 1998-2019 by ILPI and was last updated Friday, February 23, 2018. Unauthorized duplication or posting on other web sites is expressly prohibited. Disclaimer: The information contained herein is believed to be true and accurate, however ILPI makes no guarantees concerning the veracity of any statement. Use of any information on this page is at the reader's own risk. ILPI strongly encourages the reader to consult the appropriate local, state and federal agencies concerning the matters discussed herein.